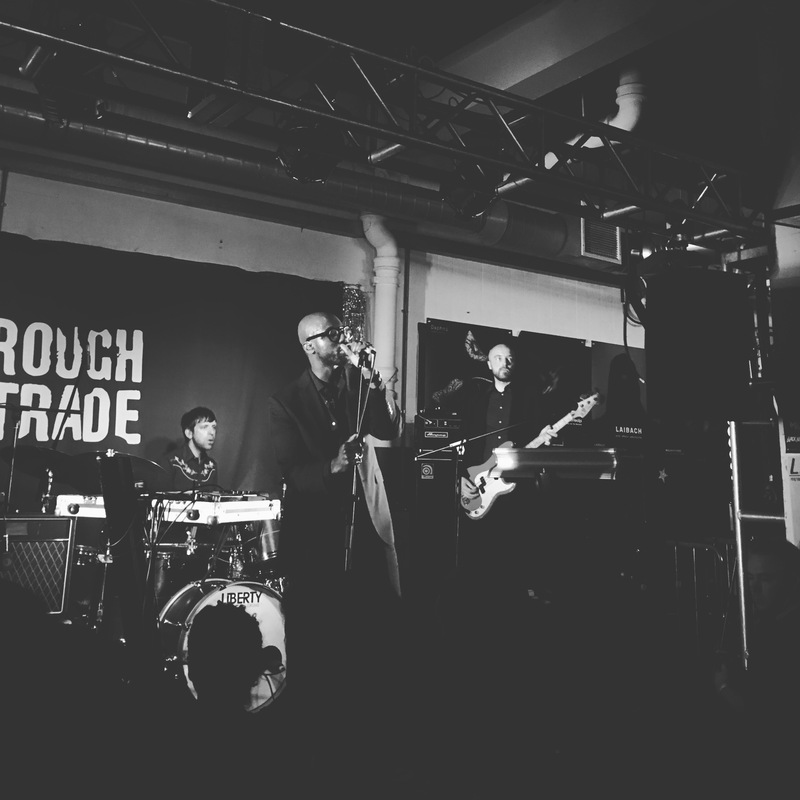 For the second time in three weeks, I’m back in Brick Lane for another Rough Trade instore performance. 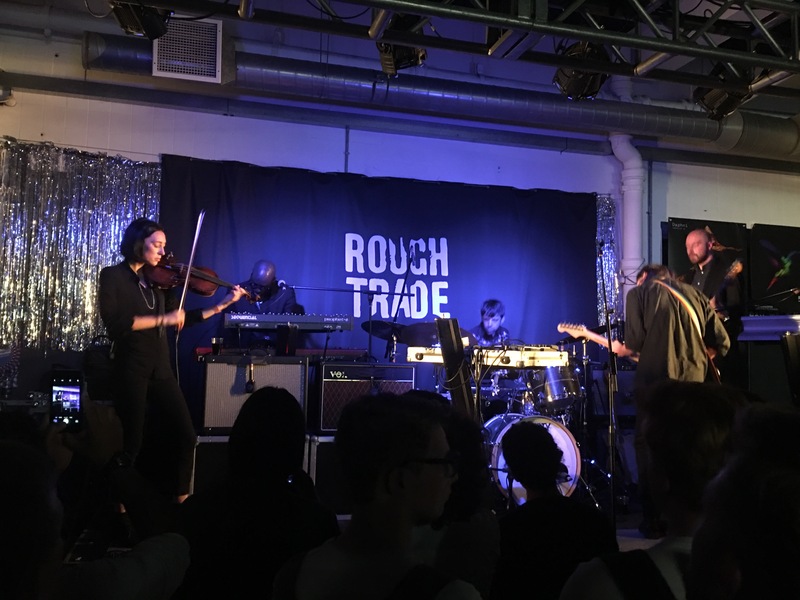 Having been down with my daughter to see Girl Ray (more on that to come soon), this time it is Ghostpoet’s turn to hit the store. Rough Trade have long been supporters of his music with “Us Against Whatever Ever” appearing on their 2011 end of year “Counter Culture” compilation. Obaro Ejimiwe has just released his fourth LP as Ghostpoet. The quality of each record is improving and “Dark Days and Canapes” is his best thus far. In the absence of new product from Massive Attack and with Tricky being typically elusive these days, Ghostpoet is helping keep the trip hop/downbeat rap flame alive. UK hip hop has never quite got the kudos it deserves, with the possible exception of Roots Manuva. Ghostpoet is changing that. “Dark Days” is perfectly named and nuanced for the troubled times we live. Using less of a sample based approach, the new LP further refines the sound of 2015’s “Shedding Skin”. If you enjoyed Massive Attack’s “Mezzanine” or some of Radiohead’s beat driven tracks then “Dark Days” is probably for you. Indeed Massive Attack’s Daddy G features on “Woe Is Meee”, returning the favour after Ghostpoet appeared on the Bristol band’s superb “Come Near Me” last year. He’s captured that with bells on. He worked on the LP with Brian Eno collaborator and musical polymath Leo Abrahams who has crafted a dense but accessible sound for the LP. Alt-J’s Joe Newman contributes the layers of guitar that provide the backdrop for Ghostpoet’s observations. Ejimiwe is well into his thirties now and his world view is mature. He spoke with his wife about the material that he would cover, in particular he described the plight of immigrants fleeing Africa across the Mediterranean with his wife and decided a direct approach was in order for the first single from the LP, “Immigrant Boogie” (“No-one knows/How many/On the boat/ Violent skies/Won’t tell us/Where to go“). It may sound dry and dour stuff but the melodies shine through and there is enough going on rhythmically to move one’s body as well as one’s mind. The bass lines are direct too and the whole record has a sense of momentum. This lean direct approach worked perfectly at Rough Trade. Coming in a run of promotional work and in advance of the full tour in the autumn, the band delivered a ten song set drawing heavily on the latest album. All dressed in black with Ghostpoet himself channeling a Nick Cave look in a sharp black suit/black shirt/gold cross combo, the band were ready to quickly take care of business. Ducking and weaving like a prizefighter, Ghostpoet was always offering up a visual point of focus. Opening up with “Many Moods At Midnight”, the guitars were pushed to the fore and the song wouldn’t have sounded out of place on PIL’s “Metal Box” LP. The band were superb, channeling that post punk vibe through the set. “Woe Is Meee” had a wonky Specials AKA rhythmic trip up its sleeve whilst “Immigrant Boogie” had a stripped down almost Bauhaus gothic chill. 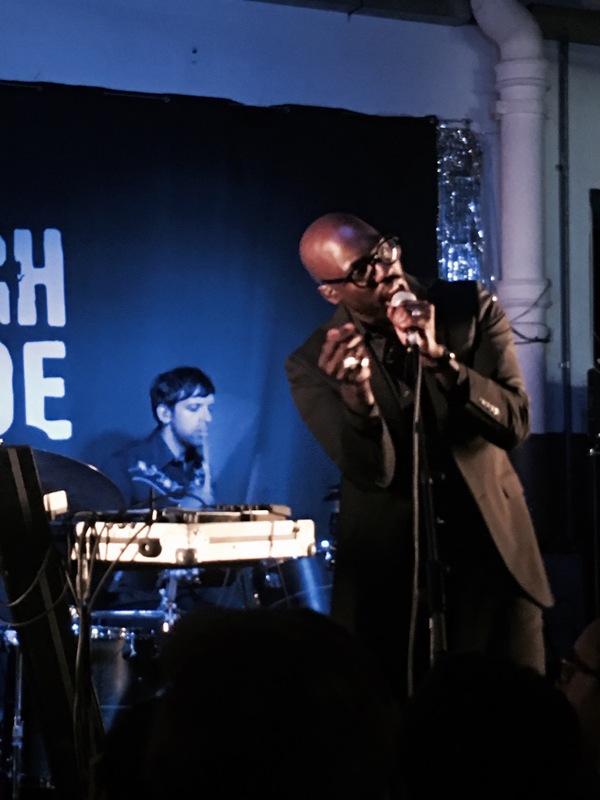 Ghostpoet was adding some electronic effects, tapping at an box of tricks, twisting and coaxing new sounds from the band, almost live mixing on the hoof. It was a short but stunning performance. I was fortunate enough to meet the man himself afterwards. He was chatty and charming. I asked how he had arrived at the gritty live direction that the album and show was based upon. He said that he had felt limited to the scope of his computer on his early material. As he has become more successful, the opportunity to work with a live band has materialised and he has always loved guitar music. It offers something compelling and unique. I suspect “Dark Days” will be near the top for those end of year polls. Even in the abridged format, it was a vital performance. If you get the opportunity to see the band on the road later in the year, I’d advise you to take it. Ghostpoet is evolving with each record he makes – this one is very special and he has the live show to back it up too.